Templeton Pool hosts the first trans-inclusive public swim this weekend. 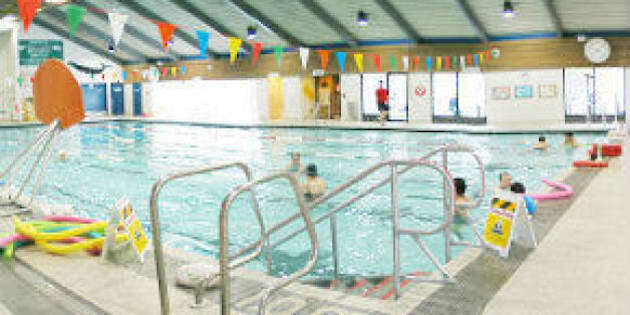 It is intended to provide a safe environment for people to access the pool, change rooms, washrooms, and showers without fear of discrimination based on their gender identity. "For some people this will be the first time that they&apos;re entering a swim facility in their lives. They&apos;re joining a group of friends to do something very exciting, but that also causes them a lot of fear," said Kai Scott, co-chair of the Trans* and Gender Variant Inclusion Working Group. Public pools can be especially hard for trans individuals to navigate, Scott said. Many are apprehensive about swimwear and fear being rejected by other swimmers. "I&apos;ve had top surgery as a trans man. I have visible scars from that transition. Often times, people are staring, or curious, or what not. It&apos;s not necessarily malicious, but there&apos;s a discomfort that comes into play," he said. "I access facilities because I power through that discomfort and anxiety. There&apos;s others that, it&apos;s too much for them. This is one battle they can&apos;t or won&apos;t take on." Scott says tensions at the pool often arise from a lack of familiarity or understanding, rather than harmful intention. For him, this is an opportunity to begin bridging those gaps. Trained staff will be on hand at Templeton to educate patrons regarding gender sensitivity, answer questions and help direct people to the appropriate change rooms, washrooms and showers. Scott noted this is not a trans-only swim. "Given our experience with exclusion, we want to be as inclusive as possible," he said. "It&apos;s not just about us being in isolation among ourselves. Ultimately, we bring a whole bunch of people along on this journey. We increase our understanding of one another and hopefully go forward together." Scott said this is a small but significant piece of what will inevitably be a long process to improve conditions for transgender people. "There&apos;s all these pointers within facilities and society at large that say, &apos;You don&apos;t belong. You&apos;re not welcome,&apos;" he said. "People are dealing with the medical side of things. They&apos;re dealing with government. They&apos;re dealing with education. There&apos;s so many fronts that there&apos;s challenges. If within the recreational context, we can remove that anxiety, that burden, then it would be really wonderful and exciting. You can build from there." "I&apos;m thinking about the trans children that I&apos;ve met along the way. An 8-year-old trans boy and an 11- year-old gender creative kid that came to our community meetings. They spoke about the struggles they&apos;ve encountered. If we can avoid that and build a path where facilities are inclusive of all, then I think we can spare them a lot in the future. That&apos;s where my motivation comes from for the people now, and for future generations," Scott said. In April, the Vancouver Park Board accepted 77 recommendations to make public spaces more welcoming and inclusive of trans and gender queer individuals. These included changing signage, improving staff training, and updating community programming. Scott said Templeton is the first place that concrete changes have been implemented on that front. Signage at Templeton Pool no longer uses male and female symbols for their facilities. Rather, the signs reflect function, or as Scott put it, "what you can expect in those spaces, rather than who should be in those spaces." The weekly swim takes place from noon to 2 p.m. PT on Sundays, beginning Jan. 11. Currently in a pilot stage, Scott said the plan is to expand the program to other community centres.